[7 mins.] Podcasting from the 39th edition of the Toronto International Film Festival. This first segment was recorded in collaboration with the film festival podcast, The Daily Buzz, produced by Irene Cho. In this segment I interview the 3 filmmakers behind the new documentary, "The Yes Men Are Revolting": Laura Nix, Mike Bonnano & Andy Bichlbaum. The latter two gentlemen are also the brain trust behind the Yes Men organization which creates elaborate hoaxes, staged in order to call attention to major corporations anti environmental practices, and other forms of activism, but all done with humor. "The Yes Men Are Revolting" is actually the third documentary in a series about Andy and Mike, following "The Yes Men" (2003) and "The Yes Men Fix the World" (2009). This installment gets more personal including scenes about their personal lives and their own interpersonal relationship. [22 mins. 34 secs.] 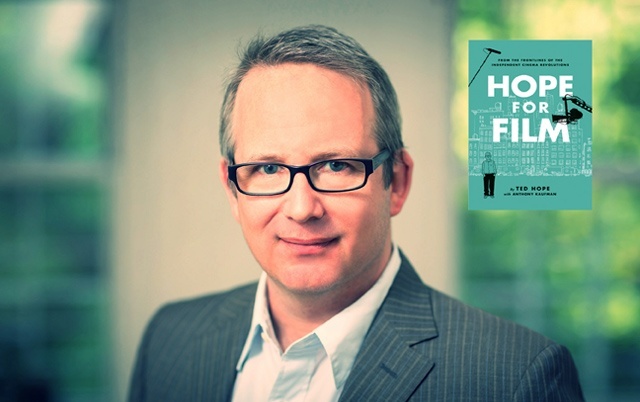 Ted Hope returns to the podcast to discuss his new book, "Hope for Film", in a more nuanced way. The book, is a quasi-memoir/quasi prescription to how to begin repairing the film industry. If it sounds ambition, that's because it is. Ted discusses the book and is passion about the industry in this Skype recorded conversation. Ted is a legendary film producer, renown blogger, and the CEO of the film streaming community site, Fandor. [50 mins. 55 secs.] Last up is Brian Parson, Head of Content Partnerships at Tugg. Tugg is a web-platform that helps bring the movies you want to your local theater through a crowd sourcing function. This conversation was recorded at TIFF as well.